Misokatsu is one of these places that I walked by for many years without even noticing it. It is located right in the heart of Kurashiki between the train station and the historical area of Bikan. The restaurant is quite small and cosy. Tamashima is right across from the bridge where I live and when I found out that a new pizza shop opened right next to the Marunaka grocery store, I pressed my wife to make a reservation at Pizza Liberta. The Kurashiki Aeon Mall Starbucks held a special tasting event on September 17th for the new Auromar Panama Geisha. It’s the latest Reserve coffee to come out and I was fortunate enough to be invited to try it for free. My quest for the great old Chinese restaurant continues and took me to the heart of Tamashima old shopping arcade. Kouchin has been in business for 55 years and it’s a gem in middle of this run down arcade. I finally visited ベトコンラーメン　or Betocon ramen and it took about 24h for the taste of garlic to very slowly vanish. When Zundouya ramen opened recently in Kurashiki, I could not help but noticing the long line at the door and the packed parking. It left me wondering if this new ramen shop was any good and my curiosity was rewarded by a great bowl of ramen. I am warning you there seem to be a line in front of that shop the minute they open at 11 AM. Tamashima city is not high on the list of places I would recommend people to visit if they have a very short time to spend around the Kurashiki area, well, that was until I was invited to Bingoya by my sister-in-law, a resident of Tamashima. Finding great Chinese food in Kurashiki or Okayama has always been a great challenge which I am proud to undertake whenever I have a bit of time. 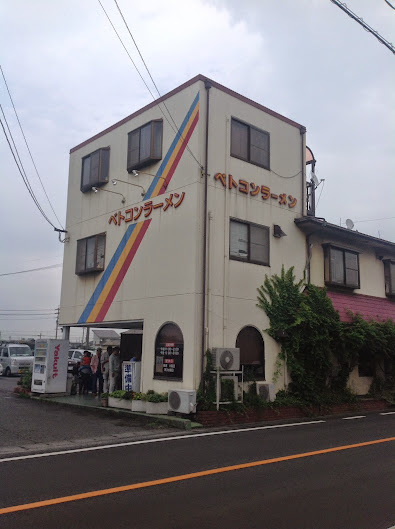 I came upon Nyan Nyan a few years ago and decided to write about it since it’s a great place for lunch and the food stands out more then the drab grey building. -Are you sure this is a coffee shop? -Yes, look at the sign, it says Coffee.